Health, Happiness, Personal Sanity & for the new experience that each marathon brings. Qualifying for Boston in Phoenix, AZ three months after open heart surgery. To help runners meet their goals. I use pacers when I have a personal time goal and understand how helpful it is when you don’t have to worry about your splits. Pacers offer a great distraction and help runners stay motivated. 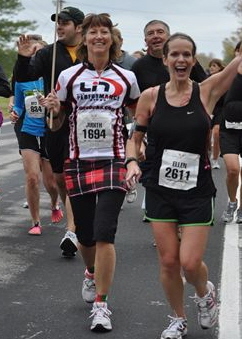 I LOVE helping other runners achieve their goals – almost as much as achieving my own. Flying Pig Marathon May 2008 – I finished within 30 seconds of my goal time and had a core group of runners who started and finished with me and were thrilled they reached their goal. We had a lot of fun and finished strong! It will be fun! I will talk so you don’t have to. I will offer tips and advice that you can use on marathon day and beyond. We will be a team and help each other through when the going gets rough. If you stay with me, you will finish in your goal time. If you don’t, you will still have completed a marathon - and your medal will look the same as mine and the same as the winner’s! Enjoy the experience. All the hard work has been done in training. Marathon day is time to reap the rewards! I didn’t start running until I was in my 40’s and now it’s something I can’t imagine not doing. 2009 was my most rewarding running year. I ran with my oldest son in his first marathon in January and then again when he broke the 4 hr. mark in October. I had my best pacing experience in Cincinnati in May. I also paced a close friend and veteran of 20+ marathons to her first sub 4 hr. marathon in November.